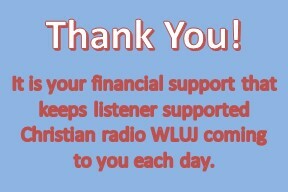 Has God blessed you as you listen to the WLUJ Family of Stations? We'd like to hear from you. Click comments@wluj.org to send us an email, write us at WLUJ, 600 West Mason Street, Springfield, IL 62702, or call 1-800-932-9585.